We come now to the last years of Palmer’s Village. According to Charles Manby Smith the village began to decline even before the building of Victoria Street. It lost its rural character, a change attributed by Manby Smith to the rising popularity of the horse-drawn cab. The owners of the cabs started to make use of the open spaces in the village. Stables were put up, the bloom and fragrance of flowers were replaced by dung heaps, and broken-kneed, broken-winded, glandered, blind, and spavined hacks supplanted the pigs and poultry. With the cabmen came late hours and midnight riot, gin-drinking and squabbling. 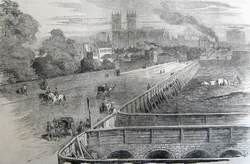 In 1845 Parliament passed the Westminster Improvement Act. It created the Westminster Improvement Commission and gave it authority to construct a street of not less than eighty feet in width to form a communication between the neighbourhood of the Houses of Parliament and that of Buckingham Palace, together with all necessary avenues and approaches to the said street. The Commission was given power to purchase land and demolish buildings along the line of the street, according to a Schedule attached to the Act. The land and the buildings included the whole of Palmer’s Village. We have come across that ominous word Improvement elsewhere in this website. In Cardiff during the 1930s the council committee supervising the demolition of Temperance Town was the Wood Street Area Improvement Sub-Committee. The most notorious use of the word occurred in the first half of the nineteenth century during the clearance of people from the Highlands of Scotland, in areas such as Strathnaver and Strathcarron. A report on the opening of Victoria Street appeared in the Illustrated London News on 6 September, 1851. Victoria Street and the other new streets were built as much as seven feet above the surrounding ground level, both to ensure adequate drainage and as a way of using up the vast amount of rubble left after the demolition of buildings. Astonishingly the report states that the first labour of the Improvement Commission, after clearing away the old houses, was to construct deep and efficient drainage for the new buildings. There is no indication that any provision was made for housing people already displaced. It is true that the Commission considered plans for new housing comprising apartments for people who could afford them and lodging houses for the “working classes”, but apart from one block of apartments, said to be nearly completed, none of these had been built at the time of the report. One place to find the Illustrated London News is the Westminster Reference Library, in St Martin’s Street behind the National Gallery. People living in Palmer’s Village would have been obliged to join the several thousand others who were seeking accommodation. Not all of them were displaced at once. At the time of the 1851 census parts of the village such as Somerset Row and Fugent’s Row had gone, presumably because they were directly in the line of Victoria Street, but there were still people living in Paradise Row, Fulmer’s Row, Providence Row, and Goodman’s Green. Within the following year or two they too moved out. One of the families that may have been displaced by the development of Victoria Street were William Alexander Hills, Sarah Ann Hills, and their children. William was a tailor, Sarah a needlewoman. They had moved with their first child to Palmer’s Village between 1837 and 1840. Another child was born in 1840, and by the time of the 1841 census they were living in Goodman’s Green. Later they moved to 7 York Place, where two more children were born. 7 York Place was one of the buildings scheduled for demolition. It seems that the Hills family then found accommodation just a short distance away, as by the time of the 1851 census their address was 4 Little George Street, now Vandon Street. Charles Manby Smith went back to Palmer’s Village just before he wrote “A Deserted Village in London” in 1853. 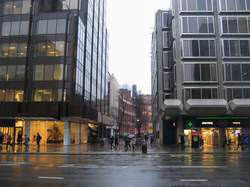 Having walked from Westminster Abbey along Tothill Street all he found at Palmer’s Village was the new road and a desolate empty building site. Of the vanished village only a few walls and some rusty hoardings remained. On that outing Manby Smith stopped to talk to an elderly man in a neighbouring street. The man recalled Mr Wiggins, the landlord of the Prince of Orange, and the village blacksmith. He had heard that after the death of his wife Wiggins had moved to Jersey and had died there. The blacksmith, the one that used to play the bells, was doing well, having made a fortune out of railway carriage buffers. The man had seen him a few years before driving in an open carriage with a pair of grey ponies over Westminster Bridge. Palmer’s almshouses lay to the north of Victoria Street and survived for another couple of decades. In the 1870s both the school and the almshouses were incorporated into large charitable organisations. Palmer’s school became part of the Westminster City School, and his almshouses were united with the almshouses of Emery Hill to become the United Westminster Almshouses. The United Westminster Almshouses still exist, now called the Westminster Almshouses Foundation. They occupy buildings constructed in 1882 on the site of Emery Hill’s almshouses at 42 Rochester Row. On the wall at the front facing onto Rochester Row there are busts of James Palmer and Emery Hill that came from the original almshouses. 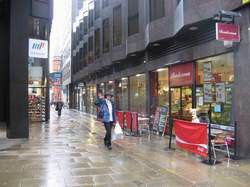 To get an impression of the location of Palmer’s Village stand outside Westminster City Hall at 64 Victoria Street. Look south across the street into Wilcox Place and Howick Place. You will be looking at the heart of the village. To find the site of the almshouses walk a short distance east and then north up Palmer Street. I went there in January 2010 and went into the Rendezvous café. As I sat with a cup of tea I wondered if anyone else in there knew that Palmer’s almshouses once stood there.